I don’t know about you all but I sure was pooped yesterday from getting up early to watch the Canadian men win the hockey gold medal at the Olympics. Yesterday was a total write off. 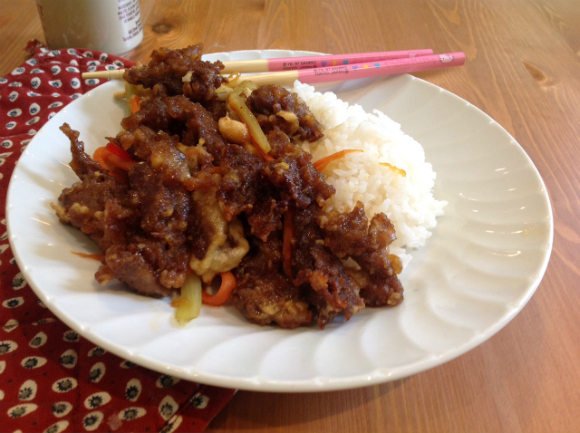 But, to celebrate I decided to make a uniquely Canadian dish, ginger beef. Yeah, you heard me right. This may be something only Calgarians know but ginger beef was actually invented in my home town. One of those, “Believe us! I swear this is an authentic Chinese dish,” sorts of things. I’m sure I had my fair share of dirty takeout ginger beef but the fondest memory I have of the “other meat candy” (named coined by me) is from Joey Tomatoes. Come to think of it, I may veganize a few more favourite restaurant meals of my early days. They may not be classic recipes from the women in my life but they sure carry the same nostalgia. In the meantime, give this one a go. After making this I realized how good it could be with Butler’s Soy Curls. I’ll have to try it next time. Defroast the vegan beef. Slice the it in to thin strips if they aren’t already thin. To make ginger juice for marinade, peel and grate ginger. Squeeze out juice. Mix the marinade ingredients. Add to beef and marinate for 30 minutes. Meanwhile, cut the carrots, celery, and pepper into thin strips. Mince garlic and use the leftover minced ginger from the preparation of ginger juice. Mix the sauce ingredients and set aside. Beat the egg made with egg substitute and add extra 1/4 c. water. Add flour and cornstarch. Mix the batter thoroughly. Heat a frying pan or wok then add vegetable oil. Drop the Gardein strips in to the batter and drop them in to the hot oil one at a time. Deep-fry the beef until golden brown. Remove and set aside. When meat is cooked, clean the pan. Heat and add 1 tablespoon oil. When oil is ready, add the vegetables and stir fry. Pour in the sauce and let it come to a boil. Add the deep-fried beef strips. Toss quickly, and remove. Serve a big old scoop with a side of white sticky rice.